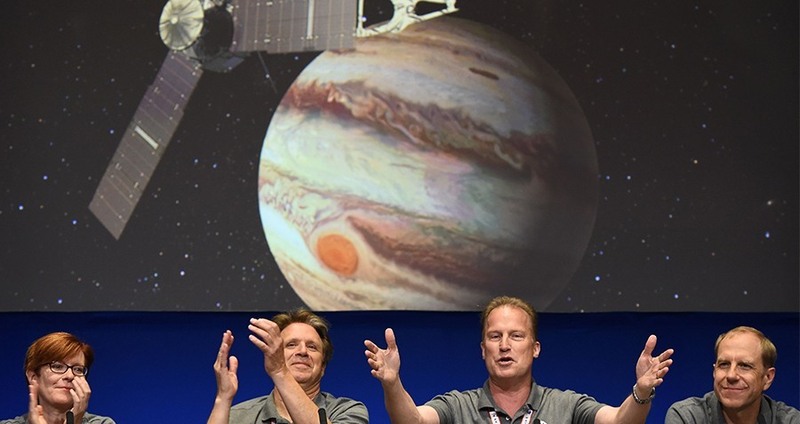 The Juno spacecraft has just started its orbit of Jupiter, according to NASA. On Tuesday, NASA said it received a signal over half a billion miles across the solar system that the solar-powered spacecraft had started to orbit the largest planet in the solar system. In doing so, Juno — whose name derives from Greco-Roman goddess Juno, the wife of Jupiter who was able to see the god’s “true nature” — became the first spacecraft in over ten years to orbit Jupiter. And it wasn’t exactly easy. In what Juno project manager Rick Nybakken called a “make-or-break” moment for the spacecraft, Juno had to slow down just enough to be pulled into orbit in an incredibly tricky event known as “orbital insertion.” In practice, this meant firing its engine for 35 minutes and then “effectively hitting the brakes” to slow down to around 1,200 miles per hour, CNN reported. “You’ve gotta fire the engine at exactly the right time in exactly the right place. That’s not easy,” said Guy Beutelschies, director of Interplanetary Missions at Lockheed Martin Space Systems, the NASA contractor that built the spacecraft. Juno managed, though — and followed its 1.8 billion mile flight plan to the second. Now that Juno is in Jupiter’s orbit, it can begin its true mission: studying the planet’s composition and evolution. As researchers believe that Jupiter is the first planet to have formed in our solar system, they think it may provide clues as to how the solar system evolved. Additionally, by assessing Jupiter’s interior, Juno will hopefully be able to provide insights into what happens beneath the planet’s clouds; if it has a solid core, and how much water it holds in its atmosphere, among other things. Juno will have nearly two years to study the giant planet. Equipped with an array of tools, Juno will circle Jupiter 37 times over the course of 20 months. It will also dive as close as 2,600 miles above the planet, making it around five times closer to the planet than Galileo, the last mission to Jupiter that ended in 2003. Next, see Jupiter’s stunning auroras.